Fact Check: Do U.S. food policies contribute to Haiti's poverty? A Cato Institute report supports claims made by Jesse Jackson that U.S. food policy contributed to Haiti's poverty. In 2006 report, Cato Institute said rice is heavily supported commodity in U.S.
(CNN) -- The Rev. 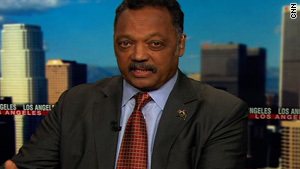 Jesse Jackson says U.S policies are partially responsible for Haiti's economic problems. In a CNN "Newsroom" interview with Ali Velshi, Jackson declared: "Our agricultural policy ... allowed the Riceland Rice company to drop rice on Haiti, drive Haiti farmers out of business, and then raise the price of rice and have rice riots." Jackson's comments echo a 2005 report by the international relief agency Oxfam International, which said U.S. policies hurt Haitian farmers and helped Arkansas-based Riceland Foods, the world's largest miller and marketer of rice. "Riceland's profits jumped by $123 million from 2002 to 2003, thanks in large part to a 50 percent increase in exports, primarily to Haiti and Cuba," the report said. CNN was unable to obtain any immediate response from Riceland Foods, which said publicly its sales to Haiti have declined over the years, but a CNN Fact Check suggests that U.S. policies have indeed played a role in Haiti's problems. In a 2006 report, the Cato Institute, a nonprofit Washington-based research foundation, called rice "one of the most heavily supported commodities in the United States," and argued that several countries including Haiti "could all plausibly claim that the U.S. rice program has driven down global prices to the detriment of their citizens." "Until the 1980s," the Washington Post recently reported, "Haiti grew almost all the rice that it ate. But in 1986, under pressure from foreign governments, including the United States, Haiti removed its tariff on imported rice." The subsidized U.S. rice was cheaper than Haitian rice, and soon, it became a staple of the Haitian diet. Many Haitian rice farmers were driven out of business, fleeing to the slums of Port-au-Prince. Later, the price of rice began to rise. It doubled in a little over a year, sparking food riots in Haiti in 2008. At least six people died before President Rene Preval announced plans to subsidize rice.